Marie passed away peacefully at the Maple Creek Hospital February 5, 2018. Her funeral was held February 9, 2018 at the Maple Creek United Church. Pallbearers were nephews: Doug, Eric, Guy, Rex, Ian and Jim Furgeson. Marie was born June 12, 1919 to Melvin and Ines Furgeson and spent her childhood 12 miles east of Maple Creek. She had a busy childhood and shared it with 7 siblings. She attended school at Moorhead and Edgehill Schools. She went to work when she was 17 years old. She worked in Calgary for a lawyer as a housekeeper/babysitter. In the early war years her dad requested that she come home to help on the ranch as her brothers went off to war. During this time she babysat for Addie Moorhead. Here she spent more time with Lloyd whom she had gone to school with. She married him on September 1, 1942 in Maple Creek. She lost Lloyd on her birthday June 12, 1990. She was a devoted rancher’s wife and wonderful mom to her two boys Melvin and Richard. She was a lady with many skills and talents. She helped fence, picked rocks, carried water, helped with cattle, milked cows, raised chickens, gardened and stoked, did carpentry, worked in hayfield, did housework and babysat. She did a lot of sewing, crocheting, knitting, quilt making and hooking rugs and had a large yard and plenty of flowers. Everyone looked forward to the homemade valentines that she crafted for each one of them every year. Marie and Lloyd loved to dance and take in rodeos. She also loved to cook and made us supper most every Tuesday evening. She always said that was when she got to catch up with family news. She loved having the grandchildren and great grandchildren come to visit. She also loved to have family and friends come for visits. She was always up for a card game or a game of aggravation. Her phone was her life line and she spent many hours catching up on news of family and friends. 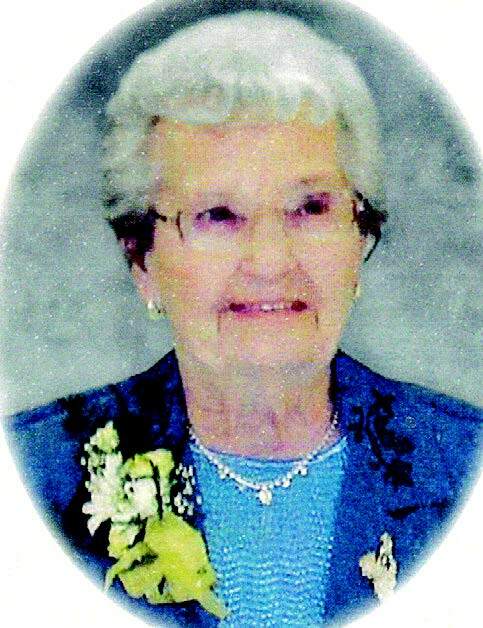 She also belonged to the Maple Creek Legion. In January 2015 Marie moved into the Southview Manor and then another move in September 2017 to Assisted Living. These were difficult moves for her as she loved living at the ranch. Marie is survived by her sons, Melvin, (Laurie) and Richard. Her five grandchildren: Darcy (Wanda) Moorhead, Darlene (Shawn) Stokke, Heidi (John) Beierbach, Clay (Debbie) Moorhead, Shauna (Casey) Jones and by twelve great-grandchildren: Kaylee, Vanessa, Erin Moorhead, Wade, Lane Stokke, Sarah, Jane Beierbach, Luke, Zack, Charlotte Moorhead, and Tucker, Kelly Jones. Her brother Earle, and sisters‐in law Mary, Margie (Stan) and Myrtle. She is predeceased by her loving husband Lloyd Moorhead, her daughter Donna in infancy, her parents Melvin and Ines Furgeson, her in ‐laws Dudley and Addie Moorhead, daughter‐in‐law Sandy, her brothers and sisters, Louisa, Hilbert, Lester, Irene, Raymond, and Stanley as well as seven brothers‐in‐law and six sisters ‐in ‐laws. Granny once said she could die tomorrow and she would be happy. She married the love of her life, watched her sons and grandkids marry theirs and was gifted with great grandchildren and good friends. She had been healthy and happy. Today we need to remember that she is finally HOME, back in the arms of grandpa. Here’s to you Granny/Grandma…until we have our next cup of tea….we love you to the moon and back. Thanks for being the best lady around. Funeral arrangements were entrusted to Binkley’s Funeral Service, Maple Creek & leader.